Please find attached agenda for the General Meeting to be held at the Roma Administration Centre on April 9, 2014 at 9.00am. 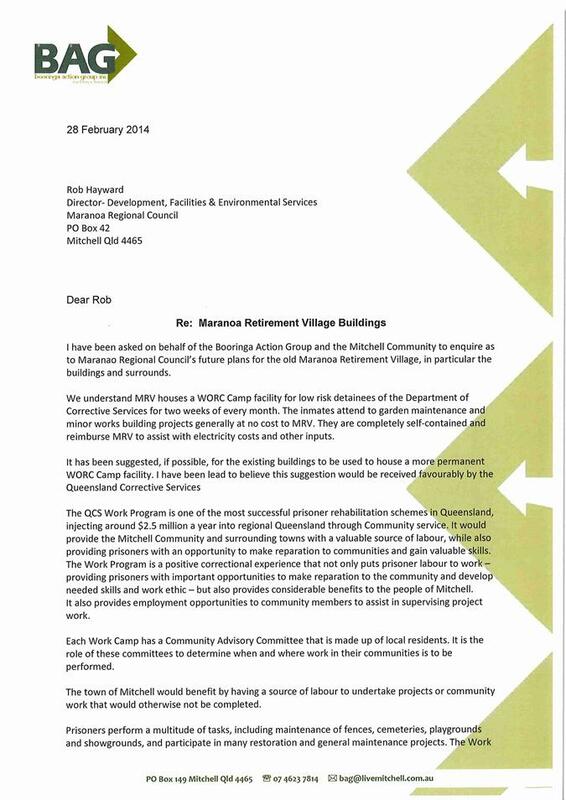 Under Section 257 of the Local Government Act 2009, MARANOA REGIONAL COUNCIL, resolves to delegate the exercise of the powers contained in Schedule 1 to the Chief Executive Officer. 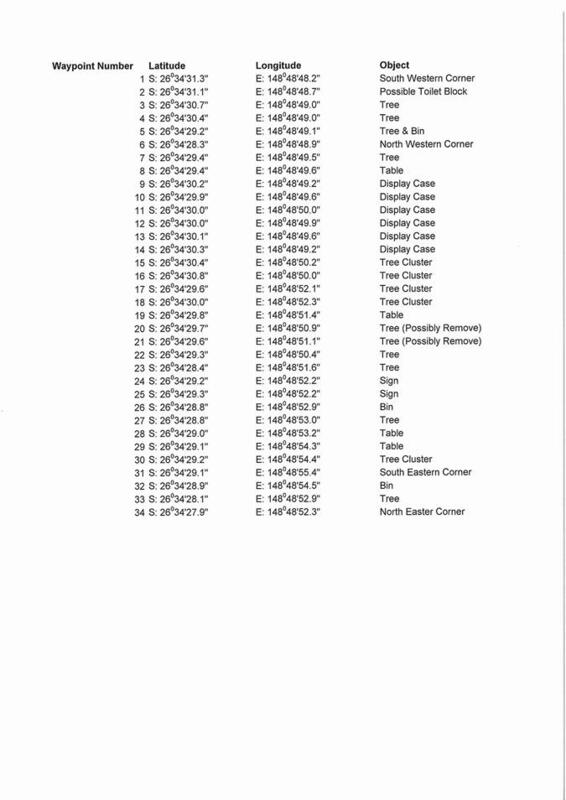 These powers must be exercised subject to the limitations contained in Schedule 2. All prior resolutions delegating the same powers to the Chief Executive Officer are repealed. The power to sign a document on behalf of a local government. 1. Where Council in its budget or by resolution allocates an amount for the expenditure of Council funds in relation to a particular matter, the delegate in exercising delegated power in relation to that matter, will only commit the Council to reasonably foreseeable expenditure up to the amount allocated. 2. The delegate will not exercise any delegated power in relation to a matter which, to the delegate's knowledge adversely affects, or is likely to adversely affect, the Council's relations with the public at large. 3. The delegate will not exercise any delegated power in relation to a matter which has already been the subject of a resolution or other decision of the Council (including a policy decision relating to the matter). 4. The delegate will not exercise any delegated power in a manner, or which has the foreseeable affect, of being contrary to an adopted Council policy or procedure. 5. The delegate will only exercise a delegated power under this resolution in a manner which complies with the requirements of Council's Planning Scheme and any exercise of power which involves a departure from or variation of those requirements will only be undertaken by Council. 6. The delegate will not exercise any power which cannot lawfully be the subject of delegation by Council. 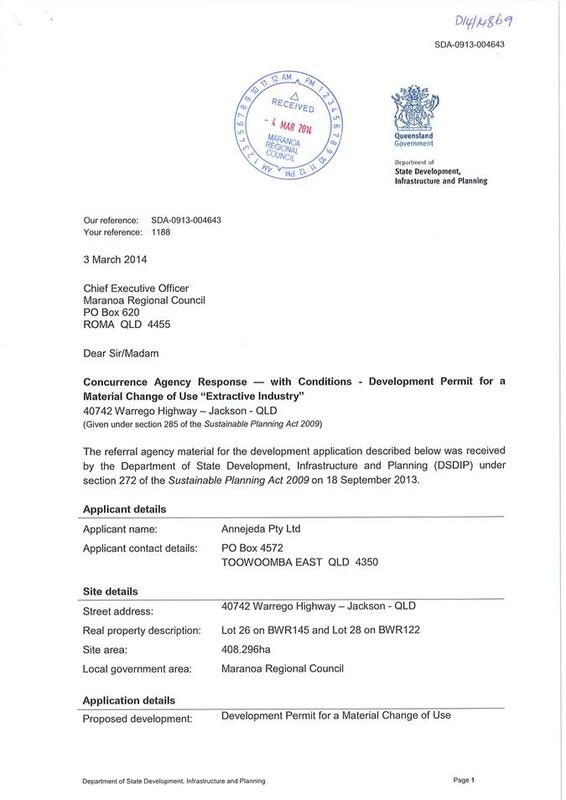 The application seeks to establish a Material Change of Use for "Extractive Industry” (up to 100,000 tonnes per annum), on land at 40742 Warrego Highway, Jackson QLD 4426 (described as Lot 26 on Plan BWR145 and Lot 28 on Plan BWR122). The applicant (Annejeda Pty Ltd) proposes to establish a white rock quarry for civil (road) construction, with an annual production of up to 100,000 tonnes. The operations at the site include winning, screening, stockpiling and loading. Although the proposed development constitutes an “environmentally relevant activity” under the Environmental Protection Act 1994, the proposed maximum production of 100,000 tonnes per annum does not constitute a “concurrence ERA” under the Sustainable Planning Regulation 2009. Environmental approval is to be considered separately from this application by the Department of Environment & Heritage Protection. The proposed extraction area is located over both Lot 28 on BWR122 and Lot 26 on BWR145 (which have a combined area of 405.28 hectares). The extraction area occupies 82.6 hectares of the total site area over four stages. The projected total extraction is 2.5 million tonnes, equivalent to 25 years operation under the requested approval. The large extraction area contains approximately 50% ‘least concern’ and ‘high value regrowth’ vegetation. 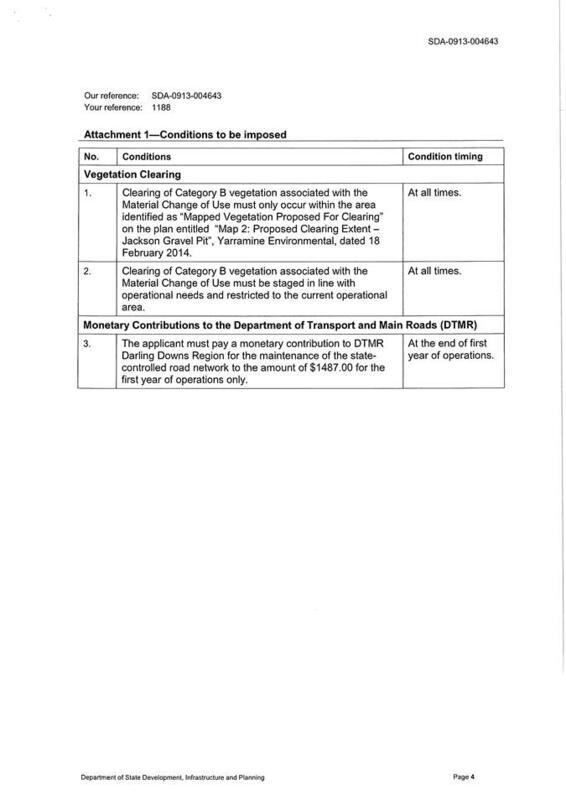 Accordingly, the proposal is conditioned to clear vegetation only within the mapped extents, and also to clear in the stages as indicated, and as operations proceed. The activity does not propose any permanent buildings or structures, and includes the use of moveable offices and amenities on site. Portable water supply, waste removal and power generation are proposed. When operating, the development will employ up to four people on site. The applicant has requested operating hours of 6am to 6pm Monday to Saturday, which aligns with the operating hours for similar developments that have been recently approved in the Region. The site is located approximately 500 metres east of the Jackson Township; the extraction area being a minimum of 1.75 kilometres from the town. Access to the site is via the Warrego Highway, which runs along the southern boundary of both lots. The site is zoned rural, and reticulated water and sewerage are not available. 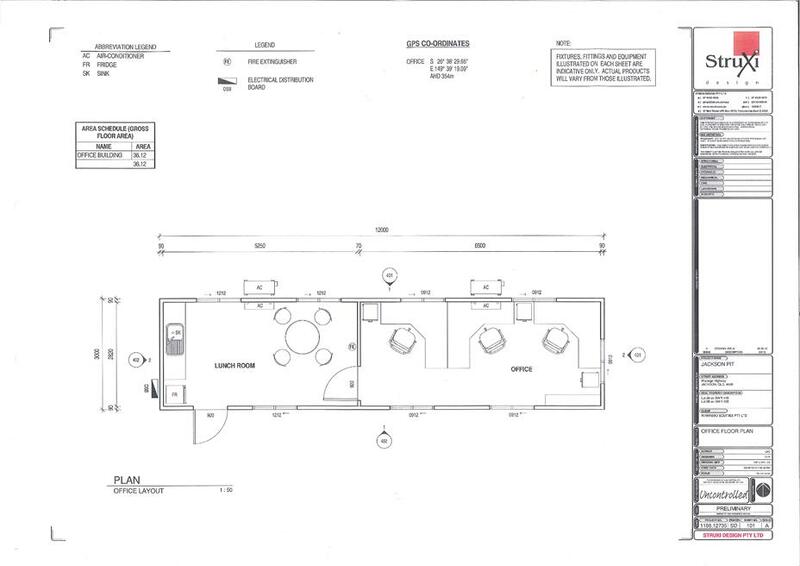 An approved use (Wastewater Treatment Facility) exists and is in operation within Lot 26 on BWR145. Both lots contain mapped remnant vegetation, and some clearing of this is proposed for the quarry. 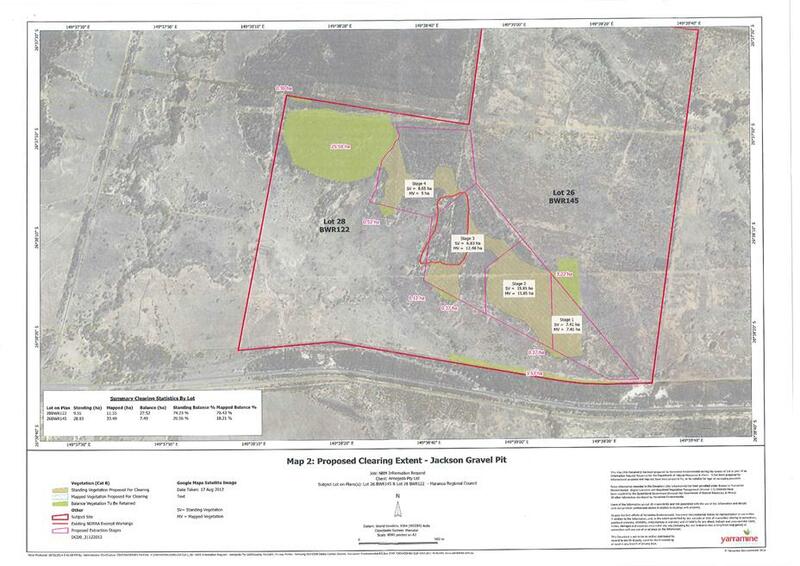 This clearing has been approved by DNRM. Lot 26 on BWR145 contains a small area of endangered regional ecosystem, but it is not proposed to disturb this area. An electricity line easement runs east – west across both lots, north of the extraction area. Ergon Energy has supplied eight conditions to protect the easement and infrastructure, and these conditions have been included in the proposed conditions of approval. There are two rural residences (sensitive receptors) closer to the proposed extraction area than the Jackson township, located at a distance of approximately 1.25 kilometres from the extraction area. 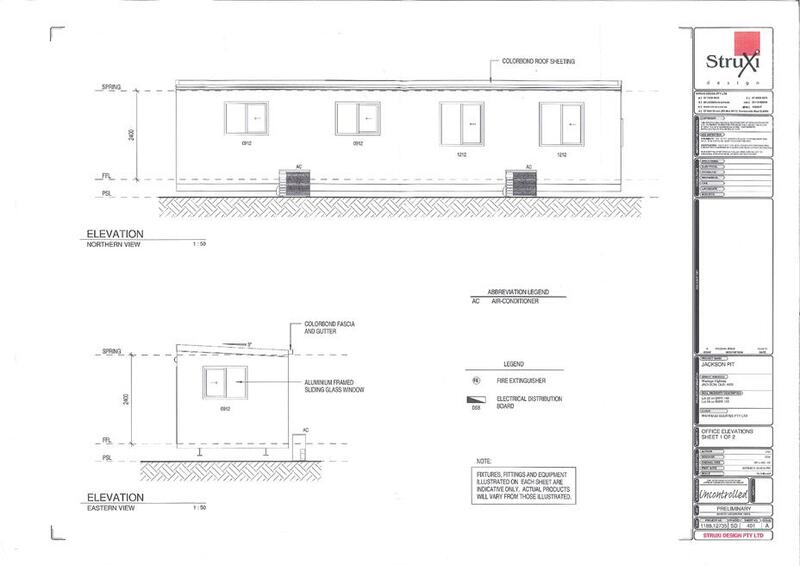 A submission has been made against the proposal by the owner of one of these properties, concerning potential dust and noise produced by the quarrying operations. Conditions concerning the minimisation of dust, noise and other nuisance are included in the approval, and are considered sufficient for managing any potential future nuisance caused by the quarry. Details of the issues raised by the submission and the management of these issues are contained later in this report. 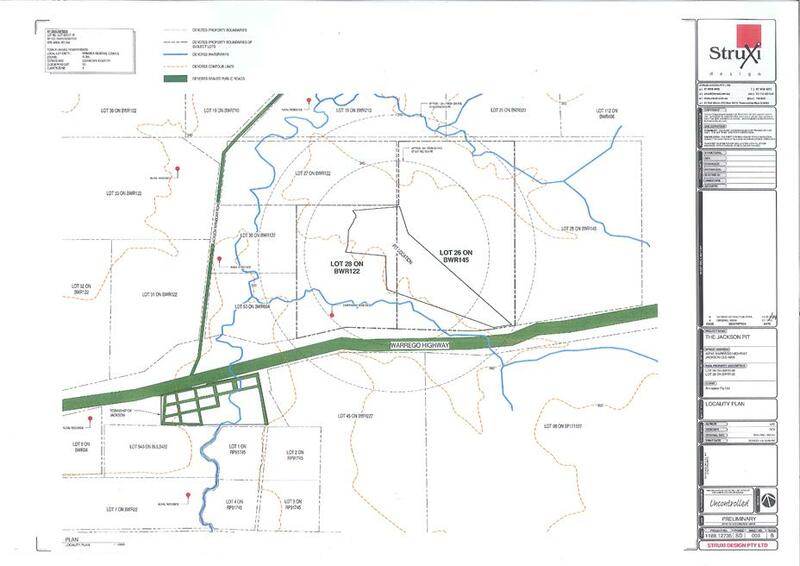 Access to the site is to be via a single entry from the Warrego Highway that is already in use as part of the wastewater treatment operations that are approved and in operation within Lot 26 on BWR145. Quarry material will be transported by way of truck & dog haul (34 tonnes) and double road trains (48 tonnes). Based on a maximum allowable extraction of 100,000 tonnes per annum, the site will generate up to approximately 1176 truck and dog movements annually, and 3,332 double road trains annually. It will also generate up to 129 vehicles movements per week. The application states that the final destination of the material is unknown but it is assumed 100% of its loaded vehicles will enter the Warrego Highway and will travel both east and west before diverging to their destination. The application has been referred to Department of Transport and Main Roads (via the State Assessment and Referral Agency). 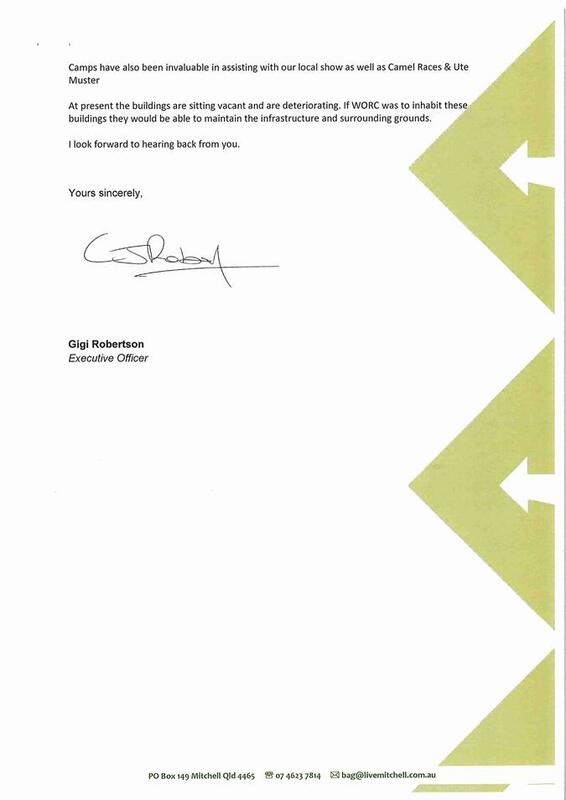 The department has responded, indicating that no additional road works are required on the Warrego Highway for the quarry’s operations, and that a single monetary contribution of $1487.00 is to be made during the first year of operation. The development site does not have reticulated water or sewerage networks available. As a result, alternative water supply and sewerage treatment solutions will need to be provided on site. Appropriate conditions of approval have been included within the schedule of conditions to ensure that a suitable potable water supply and amenities are available on site. As the development application is impact assessable, public notification is required in accordance with Section 297 of the Sustainable Planning Act 2009. The application was publically notified between 6 December 2013 and 10 January 2014. One submission was received during this period. Details of the submission are contained later in this report. "Extractive Industry" means any premises used for the winning or treatment on the land or on adjacent land, or gravel, rock, sand, soil, stone, or other similar materials. The term does not include the removal of materials authorised by Section 32(13) of the Local Government Act 1993, or mining within the meaning of the Mineral Resources Act 1989. (i) The areas of high scenic amenity, remnant vegetation, wetlands, fauna habitats and wildlife corridors and regionally significant open space in the Shire are protected. Remnant Vegetation, Protected Areas and Medium and High Bushfire Hazard Areas are identified within the development site. Clearing of vegetation is required to enable the proposed quarry operations. 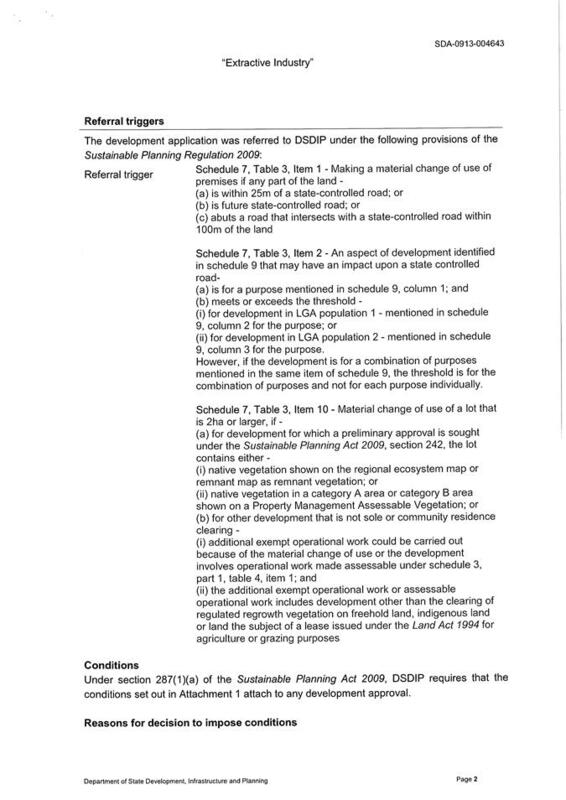 The Department of State Development , Infrastructure and Planning (DSDIP) has referred the development proposal to the relevant department, and has returned conditions of approval which limit vegetation clearing to a defined area and ensure the preservation of surrounding areas of environmental significance. The development will operate in accordance with a Site Based Management Plan and DSDIP’s conditions of approval to minimise environmental impacts of the use. The Site Based Management Plan incorporates a management strategy for the rehabilitation of disturbed areas when the uses ceases. (ii) Places, areas or sites identified as being susceptible to land degradation, including contamination, erosion, salinity and landslip, are protected and further degradation is minimised. Matters relating to land degradation can be appropriately addressed by way of the mitigation measures detailed in the activity management plans and by way of conditions of development. (iii) Ecological sustainability is achieved by maintaining and improving biodiversity, water and air quality. The development will be limited to a maximum disturbance area of approximately 82.6 hectares. Operations of the use will be undertaken in accordance with a Site Based Management Plan and conditions of approval imposed by DSDIP and the Department of Environment and Heritage Protection (in the form of approved Environmental Authorities) to minimise environmental impacts. (iv) Places of historical and indigenous cultural heritage and social significance are protected, maintained and enhanced. The site is not identified as being in proximity to a place of historical, cultural or social significance. The quarry is sufficiently remote from the places and buildings within the Jackson township to protect them from adverse impacts. (i) Good Quality Agricultural Land is protected as a major economic resource for the region. The site is identified as containing GQAL. The quarry operations will affect approximately 20% of the site, a significant portion of which is presently under regrowth vegetation, and therefore not currently productive. Extractive industry is most appropriately located in rural areas. The quantity of good quality agricultural land in the Jackson area will not be significantly changed by the development. (ii) Key Resource Areas, extractive resources, petroleum, gas and mineral resources are protected as a major economic resource for the region. The proposed development will not prejudice the operation of resource industries within the region. The material to be extracted from the quarry site is to contribute to the development of resource industries, by supplying road construction and hardstand material for civil construction. (iii) Industry, business and employment opportunities are improved and appropriately located to service the community and region, and encourage economic activity within the local area. The proposed development is for a local extractive industry within convenient travelling distance of Jackson and Yuleba, and will provide work opportunities and material for civil construction purposes. The development will therefore make a general contribution to the economic growth of the region. (iv) Rural business opportunities are improved to protect and value-add to the existing rural based economy. The proposed development brings diversity to the existing rural based economy and contributes to resource industry requirements at a local level. The development will generally improve local business opportunities and protect the existing rural based economy. (i) A convenient access to roads and services is achieved through well located land uses and the efficient use and timely provision of infrastructure such as water, sewerage and roads walkways and cycling facilities. 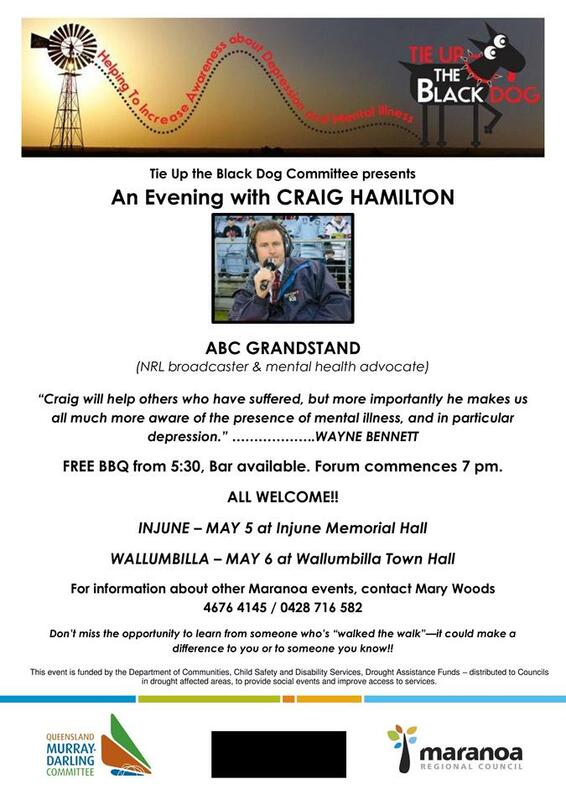 The proposed development will gain vehicle access via the Warrego Highway. Direct access to the Warrego Highway offers effective transportation of the extracted materials while keeping heavy vehicle haulage on local roads to a minimum. 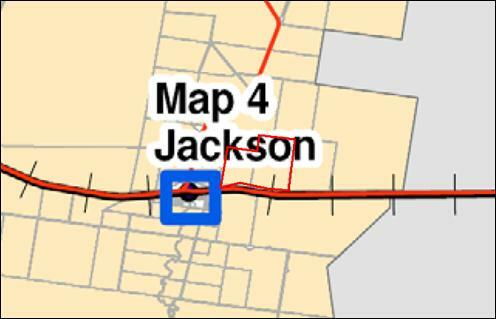 The development places minimal additional demand on existing water and sewerage services in the Jackson area. Matters relating to the provision of any other infrastructure needs can be appropriately addressed by way of conditions of development. (ii) Rural residential and urban residential development occurs in distinct localities that provide a sense of community, amenity, services, and a safe, affordable living environment, whilst maintaining the rural amenity of the shire. 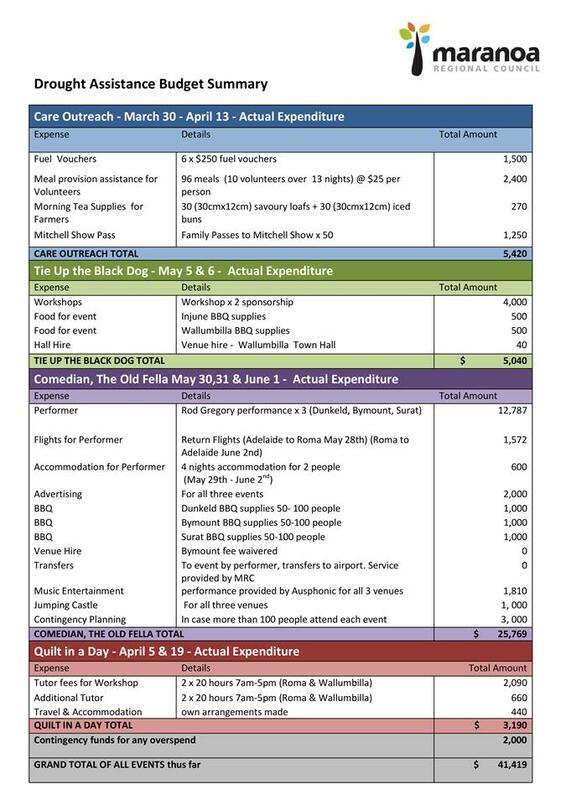 The role and identity of Yuleba and Wallumbilla townships as the main business and community centres of the shire is consolidated. The proposed development is for an extractive industry, adequately separated from Jackson to preserve the living environment within the town. Haulage from the quarry will occur directly along the Warrego Highway, and will not increase impacts of traffic within the town. (iii) Infrastructure networks such as road, rail, water cycle and electricity are protected from encroachment by sensitive land uses which may adversely affect or limit the normal operation of that infrastructure. The proposed development is not considered to be a sensitive land use and will not adversely impact on the current or future operations of established infrastructure networks. 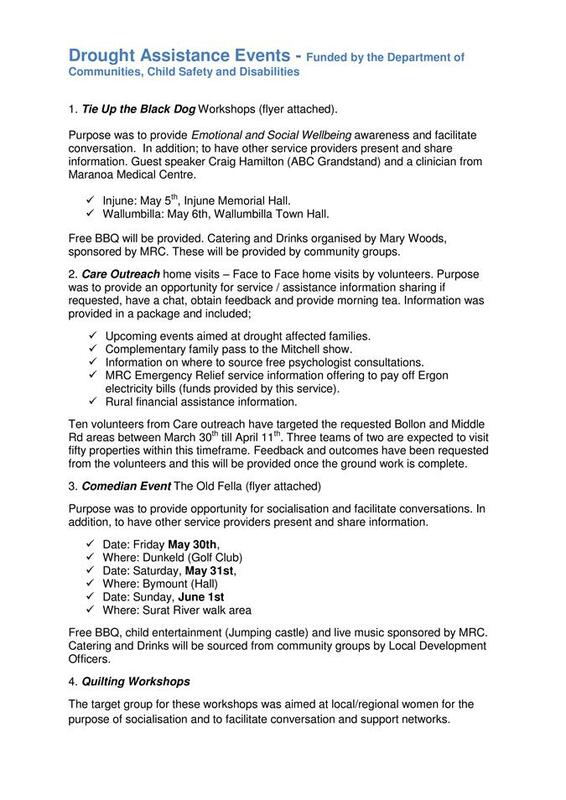 (iv) The adverse effects from natural and other hazards, including bushfires are minimised. The site is identified as containing a significant area of high bushfire hazard area. Matters relating to bushfire management can be appropriately controlled by the provision of a bushfire management plan, which is required as a condition of approval. (v) The range of housing types, services and facilities meets the needs of the community and other uses. The proposal is for an Industrial use and will not affect the range of housing types in the town. 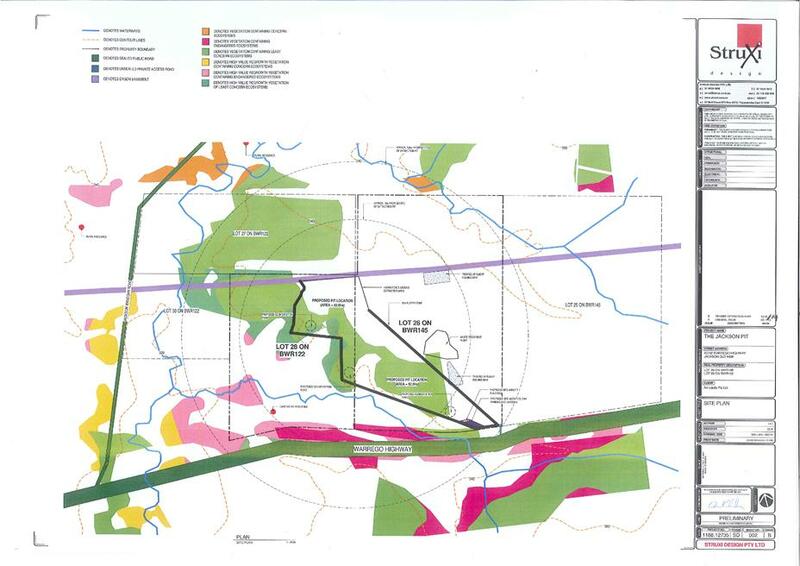 The proposed development utilizes a natural resource to develop the economic potential within the Jackson area. By contributing road and hardstand construction material, developing the resource contributes to the growth of the resource industry and other industries in the Maranoa Region. Extractive Industry is most appropriately located in the Rural Zone. Proximity to the Warrego Highway ensures that heavy vehicle haulage does not impact on local roads and the existing rural activities in the Jackson region. Matters relating to adverse environmental impacts can be appropriately addressed by way of the mitigation measures detailed in the activity management plans and by way of conditions of development. The proposed development will be undertaken within a defined area of land comprising approximately 82.6 hectares contained within a larger 405 hectare parcel. The development achieves adequate separation from sensitive land uses and buildings and excavation associated with the use will be appropriately setback from site boundaries ensuring the rural character and amenity is maintained. Extractive industry is commonly located within rural areas. Operations of the proposed use will be limited to a defined area within the site that is separated from residences on adjoining properties. The development will not prevent the continuation of existing uses to on the remaining site area. The proposed development will not significantly prejudice the establishment of other uses within the locality, including those within other zones. The proposed development will gain vehicle access to the Warrego Highway, by way of an existing sealed crossover. Such direct connection with the State controlled road offers an ideal access to the broader road network. Any environmental impacts in terms of protected areas and sites of conservation importance can be appropriately controlled by way of the mitigation measures detailed in the Site Based Management Plan, and by way of conditions of development. The site is identified as containing areas of bushfire hazard. Matters relating to bushfire management can be appropriately controlled by the provision of a bushfire management plan, which is required as a condition of approval. The proposal has only a relatively small requirement for services, and has been conditioned to allow for this requirement to be provided with temporary and transportable delivery. Provision of electricity may also be via onsite generation. Impacts on infrastructure are to be appropriately addressed by way of conditions of development. Impacts on the local road network are mitigated by the application of charges for transportation of heavy materials within the region via the application of the network access charge to the development. Premises are provided with a supply of electricity adequate for the activity. The proposal includes the provision of on-site electricity generators, suitable for the use. Reticulated electricity is available if required in the future. Matters relating to the provision of electricity can be addressed in the conditions of development. Premises are provided with an adequate volume and supply of water for the activity. The proposal includes sedimentation ponds which will provide onsite storage for dust suppression and fire fighting purposes. Water will also be carted in when the need arises. Matters relating to water supply can be appropriately addressed in the conditions of development. To ensure that public health and environmental values are preserved, all premises provide for the treatment and disposal of effluent and other waste water. A portable ablution block will provided for site staff. This will be installed and maintained in accordance with manufactures specifications. (c) protect and maintain environmental values. The proposal includes directing run-off from disturbed areas within the quarry work area to a sediment basin. Matters relating to stormwater collection and drainage can be appropriately addressed by way of the mitigation measures detailed in activity management plans and by way of conditions of development. Vehicle access is provided to a standard appropriate for the use. 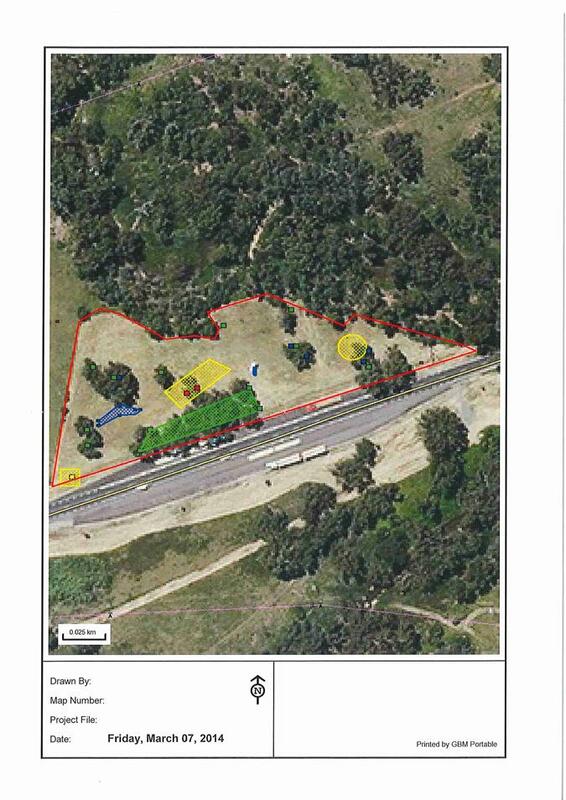 Access to the site will be provided via an existing sealed crossover to the Warrego Highway. Internal access roads will constructed of an all weather gravel material. Vehicle parking and service vehicle provision is adequate for the use whilst ensuring both safe and functional operation for motorists and pedestrians. The proposed activity is located on a large rural allotment, with sufficient area for onsite vehicle parking and manoeuvring. All weather road access is provided between the premises and the existing road network. 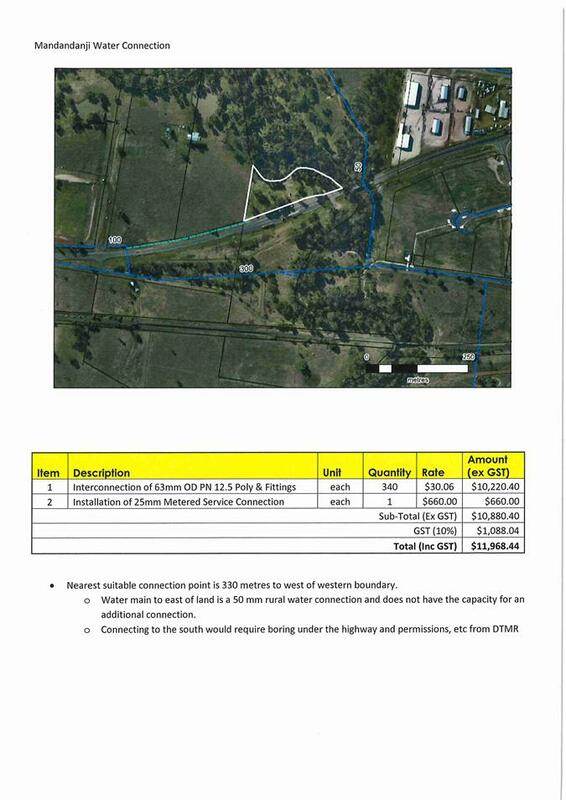 Access to the site will be provided via an existing sealed crossover to the Warrego Highway. All Highways are maintained and enhanced as a link between major centres. Noise sensitive developments (residential, educational and community) must ensure that road traffic noise levels are appropriately managed to achieve acceptable levels of amenity. 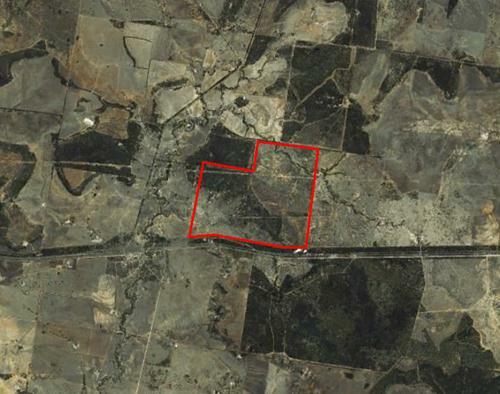 The site is provided with an existing sealed access to the Warrego Highway. DSDIP/DTMR have assessed the development application in relation to impacts on road infrastructure and have imposed conditions. Buildings are located at an appropriate distance from pipelines to ensure community safety and operation of the use is not compromised. N/A – The subject site is not located in close proximity to any gas or oil pipelines. Buildings are located at an appropriate distance from refuse tips or effluent treatment plants to ensure community safety and operation of the use is not compromised. A waste treatment facility currently operates on Lot 26 within the site. The proposed extraction areas and site operations are appropriately separated from the waste facility and will not be adversely affected by its operation. Development is at an appropriate distance from the rail corridor so as not to prejudice safety, speed or intended role of the existing and proposed rail corridors. 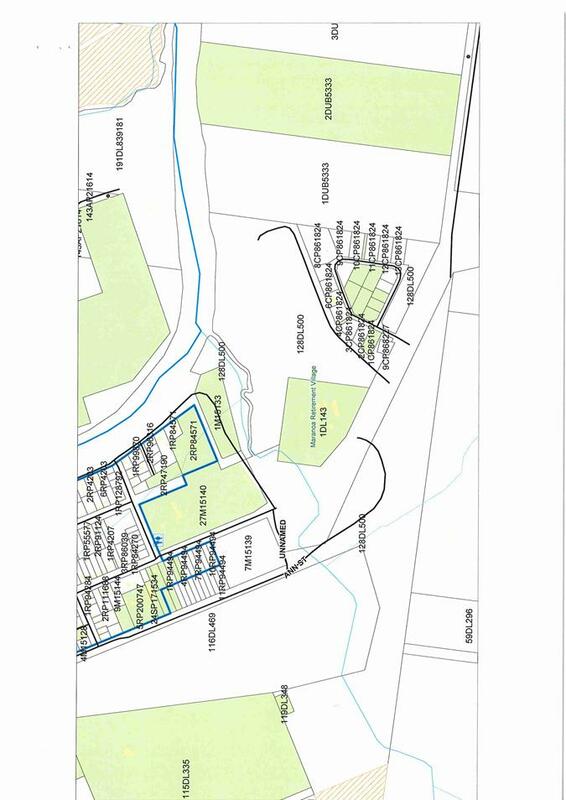 The subject site is separated from the rail corridor to the south by the Warrego Highway. The development will not affect the operation of the railway nor be impacted by noise from rail activity. Transmission lines within an Electricity transmission line easement are protected from vegetation. No development will occur within the electricity easement located at the north of the subject site. 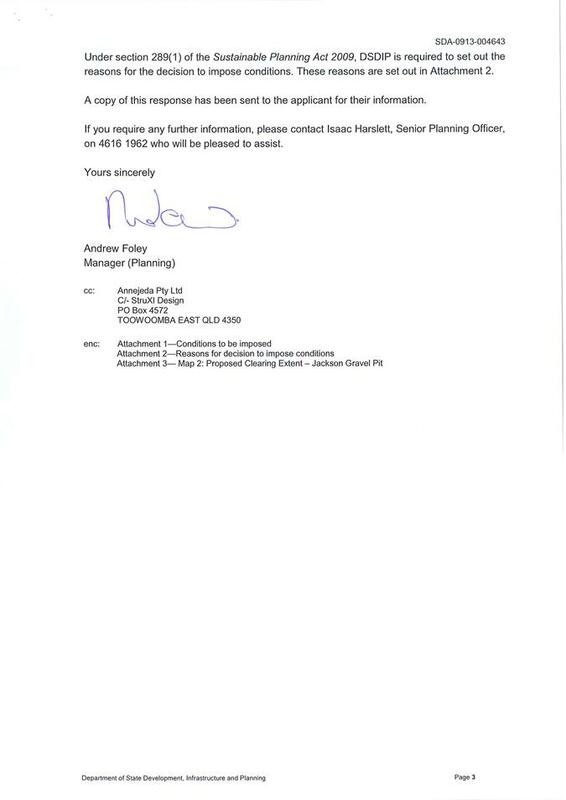 Conditions protecting this infrastructure have been imposed in accordance with Ergon Energy advice. Habitable buildings and community orientated uses are located a minimum distance from lines to ensure community safety. No development will occur within the electricity easement located north of the subject site. Development ensures the maintenance of riparian areas and water quality including protection from off-site transfer of sediment. The stormwater management plan details how stormwater runoff will be controlled to ensure water quality guidelines are met. Compliance with this will be enforced as a condition of approval. Stormwater within the site will be collected for treatment and reused for dust suppression and fire fighting purposes. (c) not to have an undesirable impact of the extent and magnitude of flooding. The proposed quarry is not located in areas that may be subject to flooding. Air emissions from premises do not cause environmental harm or nuisance to adjoining properties or sensitive land uses. It is considered that the proposed development will not create significant air emissions. 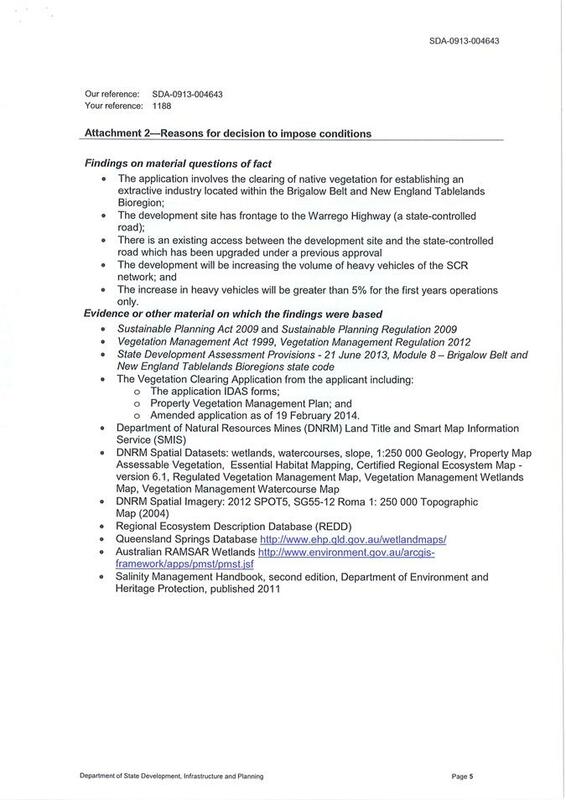 The Department of Environment & Heritage Protection assessed the application in relation to environmental impacts and issued a permit (separate to the assessment under SPA 2009). Noise emissions from premises do not cause environmental harm or nuisance to adjoining properties or sensitive land uses. Matters relating to noise emissions can be appropriately addressed by way of the mitigation measures detailed in the activity management plans and by way of conditions of development. The proposal includes directing run-off from disturbed areas into a sediment basin, the water from which is to be used for dust suppression and fire fighting purposes. (b) soil erosion is kept to a minimum with remedial works. Matters relating to excavation and filling can be appropriately addressed by way of conditions of development. Both erosion control and silt collection measures are undertaken so as to ensure protection of environmental values during construction. Matters relating to construction activities can be addressed in the conditions of development. Good Quality Agricultural Land areas as identified on Map R2 - Good Quality Agricultural Land are conserved and managed for the longer term and protected from development that may lead to its alienation or diminished productivity. Remnant Vegetation, Protected Areas and Medium Bushfire Hazard Areas are identified within the development site. Clearing of vegetation is required to enable the proposed quarry operations. DSDIP has assessed the development proposal and imposed conditions of approval which limit vegetation clearing to a defined area and ensure the preservation of surrounding areas of environmental significance. The development will operate in accordance with a Site Based Management Plan and conditions of approval imposed by the DSDIP to minimise environmental impacts of the use. The Site Based Management Plan incorporates a management strategy for the rehabilitation of disturbed areas when the uses ceases. Development is undertaken to ensure areas of significant biodiversity and habitat value are protected. The proposed development will involve some clearing of Protected Areas in order to extract the resource. DSDIP have imposed conditions of approval restricting vegetation clearing to a defined area to ensure the preservation of surrounding areas of environmental significance. The Site Based Management Plan incorporates a management strategy for the rehabilitation of disturbed areas when the uses ceases. The proposed development will not be undertaken on slopes greater than 15%. The site is identified as containing a small area of medium bushfire hazard risk. The proposal provides for suitable buffer areas and an adequate on-site water supply for fire-fighting purposes. Recommended conditions of approval require the development of a bushfire management plan. Development adjacent to buildings identified as heritage or character buildings in Schedule 10 incorporates design features, materials and details that blend with the existing character. N/A – The site is not located in proximity to any character buildings. The significance of known places of indigenous and/or cultural heritage value is retained. N/A – The site is not located in proximity to any cultural heritage areas. Airborne quarry dust settling on grazing pastures and creating potential health hazards and nuisance. The applicant proposes to implement dust mitigation measures including but not limited to dampening down of cleared areas, gravel pit working areas, access roads, stockpiles and hardstand areas; fitment of water sprays in crushing and screening plants at material transport points and discharge stockpiles; and limiting the traffic speed within the site to 20km per hour. Environmental impacts of the activity, including nuisance as a result of dust, are regulated by the DEHP through the issue of an Environmentally Authority. The recommended conditions of approval address potential nuisance to adjoining landowners and require the provision of onsite water supply for dust suppression. 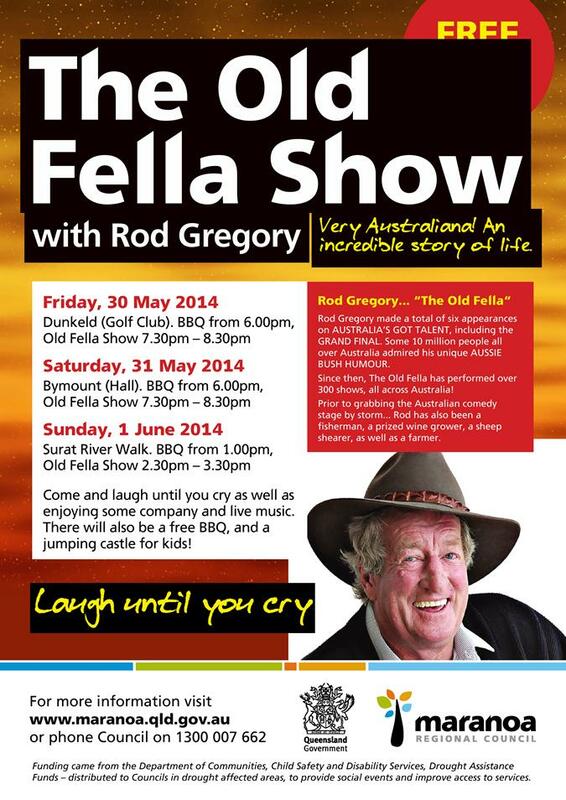 Access to the site will be directly to a ‘fit for purpose’ road being the Warrego Highway (State-controlled Road). The recommended conditions of approval restrict the development operating hours to 6am to 6pm Monday to Saturday and do not permit operations on Sundays or Public Holidays. 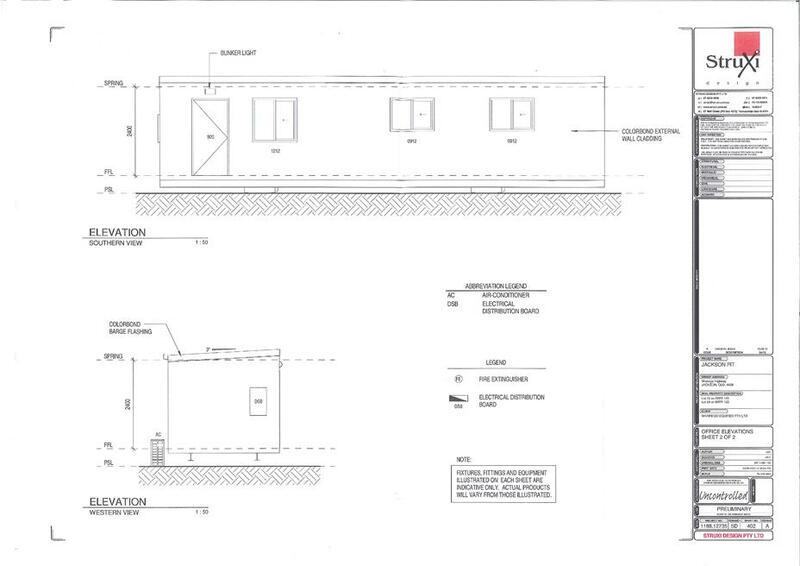 Any excessive noise from the development will be managed by the DEHP as part of the Environmental Authority. The development includes the establishment of sediment ponds to capture and treat stormwater runoff from disturbed areas. Water quality will be managed by the DEHP as part of the Environmental Authority. Decline in property value as result of traffic noise and dust nuisance. Potential nuisance from the development as a result of traffic, noise and dust are addressed through compliance with the recommended conditions of approval and Environmental Authority granted by the DEHP. Decline in property value is not a planning consideration.